Reflections Around the Campfire: National Park Service Centennial Postage Stamps - Still Available! 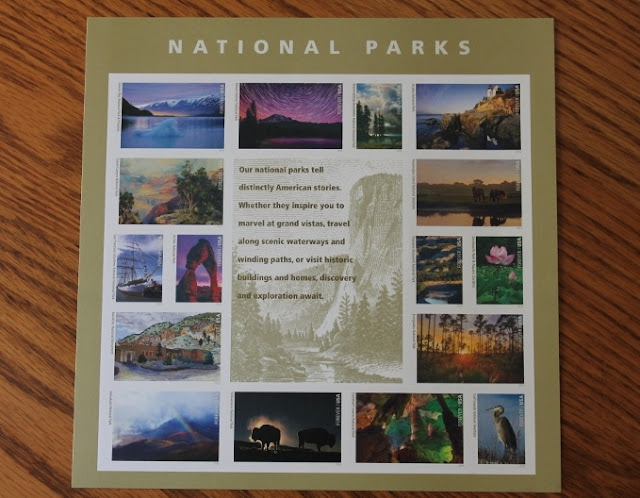 National Park Service Centennial Postage Stamps - Still Available! Have you seen the National Park Service stamps?! They are GORGEOUS! 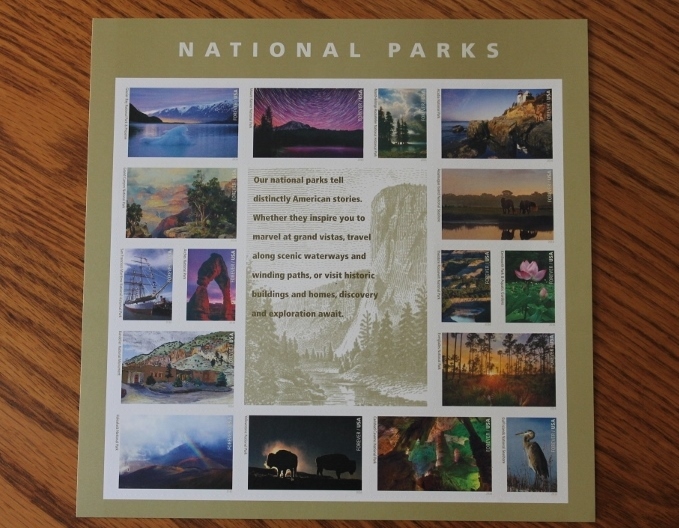 As part of the year-long celebration of the National Park Centennial (1916 – 2016), the United States Postal Service issued a sheet of 16 “Forever” stamps in June of 2016 that depicts views of National Parks or plants, animals, artwork, objects, and structures found in or associated with a National Park. Represented are Glacier Bay National Park and Preserve, Mount Rainier National Park, Marsh-Billings-Rockefeller National Historical Park, Acadia National Park, Grand Canyon National Park, Assateague Island National Seashore, San Francisco Maritime National Historical Park, Arches National Park, Theodore Roosevelt National Park, Kenilworth Park & Aquatic Gardens, Bandelier National Monument, Everglades National Park, Haleakalā National Park, Yellowstone National Park, Carlsbad Caverns National Park, and Gulf Islands National Seashore. The image in the center of the sheet is a detail of the one cent Yosemite postage stamp that had been issued in 1934. Take a look at these stamps, my friends. They’re spectacular and they reflect the many different and intriguing personalities of our National Parks, Monuments and Historic Sites. What an excellent way to celebrate the Parks! A round of applause and a tip of the hat to the many individuals who worked on this project and brought it to fruition. These stamps are available for purchase at your local Post Office or online from the United States Postal Service (link HERE).